STRASBOURG, France (Reuters) - France has put 24 green activists under house arrest ahead of the United Nations climate talks, using emergency laws put in place following the Paris shootings, Interior Minister Bernard Cazeneuve said on Saturday. Cazeneuve said the activists were suspected of planning violent protests at the talks which kick off on Sunday, a day ahead of the opening ceremony, and run until Dec. 11. 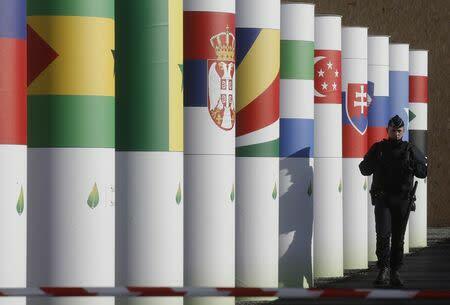 The conference, also dubbed COP21, is seeking to agree a deal that signals a break with a rising reliance on fossil fuels, blamed by a U.N. panel of scientists for causing more floods, heat waves and rising sea levels. "These 24 people have been placed under house arrest because they have been violent during demonstrations in the past and because they have said they would not respect the state of emergency," Cazeneuve said in a speech in Strasbourg. Following the Nov. 13 attacks on Paris in which 130 people were killed, the French government declared the state of emergency, banning public demonstrations and giving police extended powers of search and surveillance. "These people have no connection at all with the terrorist movement, but our forces need to be totally focused on the protection of the French people," Cazeneuve said, saying any serious public disturbance would distract police from their fight against terrorism. He did not specify how long the activists would remain under house arrest, but French media reported that they would be confined to their homes for the duration of the U.N. conference. Greenpeace France director Jean-François Julliard said that, to his knowledge, all the ecologists under house arrest were pacifist activists who had never committed any violent acts nor been charged with anything. "We have the feeling that (the government) wants to stifle criticism from the militants, but they are going about it in the worst possible way, this is repression," he said on BFM television. The interior ministry said 312 people - including the 24 green campaigners - have been put under house arrest in France since the state of emergency was declared on Nov. 14.